In May 1971, the Office of Management and Budget (OMB) proposed to limit NASA's spending to a peak of $3.2 billion during the next five years. George Low, working with his NASA associate Willis Shapley, responded by proposing a constant budget, with shuttle spending rising no higher than a billion dollars per year. Low would later describe this approach as "the only one which could convince the OMB that we could do the shuttle and at the same time have a balanced space program." Unfortunately, this billion-dollar limit left NASA with funds to build an orbiter but not a booster. Could the agency find a way to build both? As early as 1969, during the initial Phase A studies, Lockheed had taken the initiative in proposing a two-stage fully-reusable design with both stages built of aluminum and using silica tiles for thermal protection. While the final design for the shuttle orbiter would in fact use this approach, one must not think that Lockheed was prescient. Though that company indeed was in the forefront in developing such tiles, they were items for laboratory research. A design that specified their use had no more intrinsic credibility than one that proposed to use the miracle metals Unobtanium and Wishalloy. Nevertheless, the work at Lockheed suited an emerging preference within the Air Force. Late in 1969, Air Force officials stated that they wanted to build the orbiter using a conventional aluminum airframe, along with whatever form of  thermal protection would be appropriate. In contrast to strong reliance on titanium in hot structures, this preference for aluminum stemmed from an Air Force finding that the aerospace industry faced a shortage of the specialized machine tools needed to fabricate large structural parts from titanium alloy. Within NASA and its contractors, design studies weighed the relative merits of aluminum and titanium as primary structural materials. The aluminum airframe promised to be lighter in weight, reflecting the fact that aluminum is lighter than titanium. It also would be less costly to build, reflecting the industry's long experience with aluminum. By contrast, titanium structures promised to cost up to three times as much as their aluminum counterparts, and would carry greater risk in development. Titanium, however, could overcome these disadvantages with its ability to withstand temperatures of 650 °F, compared with 300 degrees for aluminum. This brought a considerable reduction in the weight of the thermal protection, for two reasons. The temperature resistance of titanium would make it possible to build the top areas of the wing and fuselage of this metal alone, without additional thermal protection, for they would be shielded against the extreme temperatures of re-entry by the bottom of the vehicle. In addition to this, a titanium structure could function as a heat sink, absorbing some heat and thereby reducing the thickness and the effectiveness of thermal protection where it would be needed. Both orbiter concepts called for building the propellant tankage of aluminum. Though the tanks would be empty of propellant during reentry, they would require insulation to keep their contents-liquid hydrogen and liquid oxygen-from evaporating. That same insulation then would protect the aluminum from heat that would soak through the thermal protection. Similarly, the crew compartment was to be of aluminum, with the crew members riding amid an insulated and air-conditioned coolness that would protect the adjacent structure from overheating as well. These orbiter concepts represented the fruit of several years of experience in the design and study of two-stage fully-reusable shuttles. They also were quite representative of what NASA now would not be able to build, under the fiscal limits of the OMB. The agency, however, had an ace in the hole, for in parallel with these Phase B efforts, Lockheed and Grumman had been pursuing studies of alternatives. For both companies, the point of departure lay in partially-reusable configurations that would carry their propellant in expendable tanks. This offered a route to lower development cost because the orbiter could shrink in size by carrying its propellant externally. The tanks could take form as simple aluminum shells, while the orbiter would have much less volume to enclose within its hot structures, and much less surface area to protect thermally. Such approaches dated to the original Star-Clipper concept of 1965. They had lost favor because the throwaway tankage would cost money, in dollars that literally would be thrown away. Partial reusability was attractive to the OMB because it would cut the all-important development cost, the year-to-year line item in the federal budget. NASA's fully-reusable approach promised huge up-front costs in return for the vague hope of large savings after everyone had retired, through reduced cost per flight. The OMB insisted on smaller short-term outlays in exchange for the prospect of a somewhat greater cost of launch, 15 years down the road. The OMB held most of the cards. By contrast, Grumman began its examination of alternative designs with no preconceived views as to how to proceed. When the work began, in mid-1970, this company started with 29 configurations in three categories: two-stage fully reusable, reusable orbiter with expendable booster, and reusable orbiter with expendable propellant tankage. Like everyone else, the Grumman manager, Lawrence Mead, concluded that full two-stage reusability would be best in the long run. His report, however, noted pointedly that the other approaches offered promising means of reducing the peak funding. Why was this approach so promising? Liquid hydrogen is bulky, having only one-fourteenth the density of water. Thus, although it makes up only about one-seventh of a shuttle's propellant load by weight, with six-sevenths being liquid oxygen, liquid hydrogen accounts for nearly three-fourths of the volume. Being low in density and hence light in weight, this fuel could be carried in external tanks of similar light weight. Being bulky, its removal would bring a welcome reduction in the vehicle size and surface area. In addition, Grumman's approach brought a useful shrinkage in the size and weight of the complete two-stage shuttle, including the booster. In designing two-stage vehicles, standard procedures exist for choosing the best staging velocity, so as to achieve the lowest weight of the two stages together. At a higher staging velocity, the first stage becomes excessively large and heavy; at a lower velocity, the orbiter requires more size and weight. Ground rules set at Marshall Space Flight Center, based on such optimization, defined this staging velocity as being close to 10,000 feet per second. For Grumman's two-stage fully-reusable configuration, used as a reference for purpose of comparison, it was 9750 ft/sec. With the liquid hydrogen now to be carried in lightweight external tankage, a re-calculation of this optimum showed that it would be advantageous to make these tanks larger, allowing them to carry more of this fuel. The orbiter then would have to carry more liquid oxygen, stored within its fuselage. This, however, would be easy to accommodate. Liquid oxygen is dense, denser than water. Hence, the extra quantity would require little additional volume and would not compromise the overall design of the orbiter. ....smaller and lighter in weight, reflecting its reduction in required performance. It also would be much easier to protect thermally. The orbiter design followed standard practice, with a main structure of titanium. Grumman's report stated that the company would rely on "materials, analysis, manufacturing and test procedures developed for the F-14 aircraft," a Navy fighter that was just entering service. The orbiter's thermal protection was to rely primarily on hot structures, in the fashion of McDonnell Douglas, with carbon composite and silica tiles at the nose and leading edges. The use of external tankage cut the dry or unfueled weight of the complete two-stage shuttle by nearly one-third, from 1.02 million pounds to 692,000 pounds. In the words of the report, this weight saving "means structure we eliminate from design, do not provide tooling for, nor build, maintain, refurbish or otherwise pay for." for those who have in the past undertaken to compare configurations from several contractors, the necessity for a dual effort of this nature is readily apparent. There is nothing more frustrating and inaccurate than to attempt to compare weight, performance, and cost from several contractors, using, by definition, their own unique preliminary design groundrules and criteria. Another group of designers worked with Max Faget at NASA's Manned Spacecraft Center. Decisions dating to early 1970 had given that center responsibility for technical direction of orbiter concepts, with NASA-Marshall receiving similar responsibility for boosters. Faget had responded by initiating studies of a succession of two-stage, fully-reusable configurations, indulging to the full his taste for straight wings and for lightweight payloads in small payload bays that would suit the mission of space-station resupply. In January 1971, when NASA officials had met with Air Force counterparts, they had agreed that the orbiter should have delta wings along with a payload capacity of 60 x 15 feet and 65,000 pounds. Faget, nevertheless, had gone his merry way, as if this agreement did not apply to him. He continued to pursue his personal preferences in shuttle design; it was well into 1971 before he caught up with the rest of the world. .....concepts had carried their hydrogen in long cylinders running alongside the orbiter fuselage, just above the wing. As early as May 1971, Faget prepared a set of drawings designated MSC-020 that put the hydrogen in a single tank, slung beneath the front of the vehicle. This concept followed his preferences by specifying straight wings, a 20,000-pound payload, and a 30 x 15-foot bay. It showed that, at least in this respect, he was willing to change with the times. The next step was to lengthen this single external tank to allow it to carry liquid oxygen as well. This would reduce the size of the orbiter to a bare minimum. The tank, attached to the orbiter's belly, would demand structural strengthening, for its store of liquid oxygen would be quite heavy. With all propellant removed from the orbiter, that vehicle could achieve a standard design, independent of the tank. The tank could grow to a particularly large size, further lowering the staging velocity of the booster. In turn, this lower staging velocity would further reduce the size of the booster, cutting the cost of the Shuttle program anew. The first such concept, the MSC-021, came forth during that May. Again, it featured straight wings and the same payload weight as in the MSC-020. Though the bay now had a length of 40 feet, it still was much shorter than what the Air Force would accept. During that same month, Faget also proposed the MSC-023, again with all propellants for the orbiter in a single large underbelly tank. It featured delta wings and a full-size bay, 15 x 60 feet. Here, for the first time, was the outline of a shuttle orbiter that would actually be built. Even so, Faget was not ready to offer an uncritical embrace of delta wings and large payload bays. 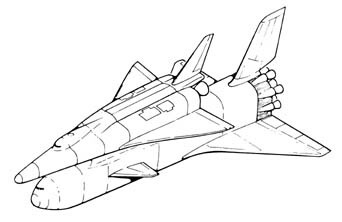 Though he now had an external tank that he liked and would stick with, his subsequent designs continued to show small bays and straight or swept wings, and sometimes both. He also examined a number of variations in the arrangement of the orbiter's main engines. Though the MSC-023 had only a single such engine, in June he released the MSC-037, amounting to a variant with three engines and a 40,000-pound payload. It matched the final design in important respects. In contrast to the rapid convergence of the orbiter designs, the booster studies fell into disarray. 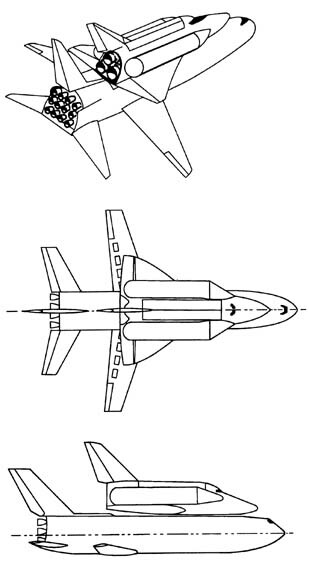 The initial points of reference lay in the Phase B booster concepts of McDonnell Douglas and North American Rockwell. Both contractors proposed vehicles somewhat larger than a Boeing 747, and weighing some five times as much when fueled. The North American concept had two dozen engines: 12 SSMEs and 12 jet engines, the latter serving during flyback to the launch site. McDonnell Douglas's booster, only slightly less ambitious, was to use a dozen SSMEs as well, with ten turbojets. The North American orbiter had featured a primary structure and skin of titanium, with tiles providing most of the thermal protection. The booster design was more eclectic. Its front section, which enclosed the crew compartment, had frames and skin of René 41, a nickel-chromium alloy that contained cobalt and molybdenum. Though it was strong and oxidation-resistant, it was hard to fabricate. Wings, vertical fin and canards, small forward-mounted winglets used for control, all were of titanium. The fuselage and its tankage were largely of aluminum. .....molybdenum. Because these metals would expand when hot, designers proposed to build the thermal protection in the form of shells, free to slide over the underlying structure. On paper, at least, the shells would not come loose. Such a design certainly was not in keeping with the preferences of Max Faget, who always sought the most conservative approach. It was an engineering efflorescence to match the economic efflorescence of the cost-benefit studies at Mathematica, and was likely to raise just as many eyebrows. Moreover, it showed that the exuberance of 1969, when Tom Paine wanted to go to Mars, was still alive. Much engineering experience is summed up in the acronym KISS: Keep It Simple, Stupid. This is what John Yardley's designers had done at McDonnell Douglas, in crafting their own booster concept. These design exercises gave both contractors the opportunity to conduct detailed investigations using a range of approaches: hot structures, aluminum and titanium primary structures, tiles, and metallic thermal protection. Neither contractor offered anything so simple as an aluminum orbiter protected with tiles, though McDonnell Douglas used this approach in its booster. Despite their complexities, however, the concepts were not obviously infeasible, and some people believed they could actually be built. Along came the Grumman design studies, which put the orbiter's liquid hydrogen in external tanks and lowered the booster's staging velocity from 9750 to 7000 ft/sec. Boeing, which had built the first stage of the Saturn V, was teamed with Grumman and had responsibility for the booster. Its engineers determined that this reduction in velocity would bring a disproportionate reduction in the size and weight of the booster, which now would require much less propellant. In addition to this, the lower velocity meant that the booster would be much closer to the launch site when it released the orbiter and began its return. Being closer, it would need less fuel for its jet engines, further reducing its size. The upshot was that whereas the  fully-reusable orbiter's booster would have a dry weight of 798,500 pounds, the new orbiter would cut this booster weight to 494,900 pounds. Better still, the lower staging velocity virtually eliminated the need for thermal protection. The booster now would need neither tiles nor exotic metals. Instead, it would use its structure as a heat sink, just as with the X-15. During reentry, it would experience a sharp but brief pulse of heat, which a conventional aircraft structure could accept and absorb without exceeding temperature limits. Hot areas would continue to demand a titanium hot structure, which would cover some one-eighth of the booster. The rest of this vehicle, however, would make considerable use of aluminum. In 1954, amid the early feasibility studies that led to the X-15, investigators found, to their pleasant surprise, that they could follow standard aircraft design practice in crafting this research airplane. As a bonus, they also discovered that its metal skin, designed for strength rather than for heat resistance, nevertheless would have enough thickness to serve effectively as a heat sink. Now, in 1971, engineers at Boeing were learning that their booster could offer the same bonus, while providing the convenience of aluminum, the most familiar of metals and the easiest to use. Unfortunately, while the move to external tankage brought a welcome reduction in peak annual funding, it took NASA less than one-third of the distance from the $2.2 billion peak funding of the fully-reusables to the $1 billion of the OMB. This move had addressed the easiest part of the problem; the rest of the solution would prove considerably more elusive. The next step came during June 1971, as the new NASA Administrator, James Fletcher, embraced what his agency had previously rejected: a phased approach to shuttle development. This called for the extensive use of interim systems that would make it possible to build and fly an initial shuttle orbiter, with development of the final systems being delayed for several years. Such an approach would be wasteful, for the interim arrangements would cost money and yet would serve merely as a stopgap. Phased development also carried political risks, for in Washington, few things are so permanent as a temporary solution. If NASA could get any kind of shuttle into space, even one of interim design, it might face strong opposition and long delays before it could win permission to build the Shuttle it truly wanted. A phased approach, however, would spread the program over a term of years, reducing the all-important peak funding level. The preferred configuration which is emerging from these studies is a two-stage delta wing reusable system in which the orbiter has external tanks that can be jettisoned. Most of the cuts in peak funding, however, would come by putting off plans to develop a fully-reusable booster, even one of smaller size and simplified design such as one of the new heat-sink versions. NASA instead would fly its orbiter atop an existing rocket stage such as the S-IC, the first stage of the Saturn V. By delaying development of a fully-reusable booster for three years, the agency could cut the peak funding to $1.3 billion per year. This would represent a reduction of nearly a billion dollars from the proposed peak funding levels of the Phase B studies, and would put NASA within hailing distance of the OMB requirement. ......Saturn production facility. Now it could cherish the hope that production of this rocket stage might continue after all. Martin Marietta was also in the picture. This firm had actively promoted the Titan III-M, in an era when NASA had been willing to consider a small shuttle orbiter that would amount to an enlarged Dyna-Soar. Though the company had done little of significance for the Shuttle after 1969, now, in mid-1971, it came forward with a new concept, the Titan III-L ("large"). This would use a new liquid-fueled core with a diameter of 16 feet, compared to 10 feet for the standard Titan III, and with up to six solid-fuel boosters of 120-inch diameter. The principal builders of solid rocket motors-Thiokol, Aerojet, United Technology, Lockheed Propulsion Co.-were prepared to make a pitch for their own units as well, arguing that suitable clusters could also provide a good interim shuttle booster. A few years earlier, these firms had built and test-fired rockets with diameters of 156 and even 260 inches. This technology had subsequently been set aside as having no immediate application. Now, however, with the Shuttle needing an interim booster, these big solid motors might see their day. A fourth approach came from NASA-Marshall: the pressure-fed expendable booster. It amounted to reinventing the liquid-fueled rocket, using approaches selected for their simplicity. 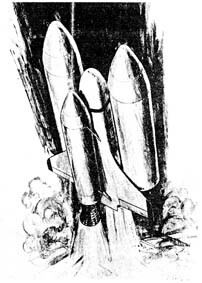 Conventional rocket stages used structures of thin-gauge aluminum that saved weight. Their engines relied on turbopumps that pumped the propellants to high pressures, with the engines operating under internal pressures that were similarly high. Such engines offered good performance and strong thrust from compact and lightweight units. The turbopumps, however, were costly and difficult to develop, and at times were prone to failure. ....job. This diversity of boosters meant that there now was no clear reason to choose any of them. The wide range of alternatives recalled the era of the late 1960s, when a hundred flowers had bloomed and when neither NASA nor the Air Force had yet developed a convincing idea of how a shuttle should look. .....and even below 4000 ft/sec. This further enhanced the prospects for reducing the booster size and easing the problem of its thermal protection. Though it lacked wings, the pressure-fed booster became a candidate for reusability because its thick aluminum skin would easily serve as a heat sink. This same robust skin would allow the vehicle to come down by parachute and land in the ocean, surviving the impact and the subsequent perils of the sea. It would enter the water 200 miles offshore; a boat would then bring it back. No  one was prepared to describe this as graceful; with this form of makeshift added to those of its design, the concept was unofficially called the Big Dumb Booster. Such dumbness seemed, however, to promise a new path to wisdom. A more elegant reusable booster concept came from Boeing, which proposed to remodel its S-IC by turning it into a big airplane. It would receive wings, a tail, a nose with a flight deck, and 10 jet engines for the return to its launch site. Though the standard S-IC had never been built for reentry and reuse, thermal protection would not be a problem; modest thickenings of its aluminum skin now would provide heat sink. To emphasize its short-term feasibility, Boeing's technical artists presented top and side views in lavish detail, even specifying the location of the onboard power units and the choice of tires for the landing gear. At a time when NASA still expected to defer building a flyback booster for several years, one member of the study team emphasized that "our proposal is the reusable booster." By late September, NASA was ready to abandon phased development, returning to the original plan of simultaneously building the booster and orbiter. The booster would be either the winged S-IC that used standard F-1 engines, or the Big Dumb Booster with pressure-fed propulsion. In turn, the orbiter would use phased technology. It would have a full-size payload bay, but would use four J-2S engines; the SSME program would go on the shelf. For thermal protection, the orbiter would rely on an ablative heat shield, even though this would demand costly replacement after every flight. In time, however, the SSME could be resurrected for use in an upgraded orbiter. This orbiter would also use tiles or hot structures, as reusable and low-cost thermal protection. These costs compared with estimates prepared by the Aerospace Corp. for a two-stage fully-reusable shuttle: development, $9.92 billion, with a peak of $2.34 billion.20 The pressure-fed booster yielded a development cost less than half that value, with a peak comfortably under the OMB ceiling of $1 billion. The winged S-IC was only slightly more costly, and it preserved all the operational advantages of the fully-reusable boosters of Phase B, on which NASA had placed so much hope. Phase B was the first really extensive effort to put together studies related to the completely reusable vehicle. As we went along, it became increasingly evident that there were some problems. You had to develop two hypersonic aircraft configurations, simultaneously. The engine problem was compromised. Trying to use common engines made them not optimized for either case. We ran into a problem of pilot escape from the booster in the event of an abort. We never could quite figure out what to do about it. And then as we looked at the development problems, they became pretty expensive. We learned also that the metallic heat shield, of which the wings were to be made, was by no means ready for use. The slightest scratch and you are in trouble. It became increasingly evident that you want to have the cheapest possible configuration, but you put all this time and effort on a vehicle, the biggest part of which (the first stage), its only role was to get the orbiter up high enough for it to fly itself. So here you're spending all this effort on a part of the system that had no basic payoff. The important thing is the orbiter-that is the payoff. So you see, it was easy to say, "Why do we break our necks putting twelve engines in this damn big reusable booster? You cannot get the pilots away, the metallic heat shield is going to give you all kinds of problems, to do it with ablative stuff makes it too heavy; drop it entirely. That started the ball rolling into other types of boosters for the orbiter. The merits of an aluminum heat-sink booster appeared stronger yet when one recalls that the most plausible Phase B alternative, which used hot structures in the fashion of the North American Rockwell design, amounted to covering much of the surface of a craft the size of a Boeing 747 with alloys that had previously seen use only in turbine blades. By comparison, the simplicity of aluminum heat sink was overwhelming. It was as much as to say that instead of attempting to leap with one swoop into the metallurgy and launch vehicle design of the twenty-first century, engineers instead could build the booster using design methods that dated to World War II. The Phase B work had also pointed to demanding issues of safety. To reduce weight to a minimum, the internal tanks had to carry part of the Shuttle's weights and loads. The resulting stresses would tend to produce leaks. Hydrogen leaks are difficult to detect, raising the prospect that hydrogen could build up beneath the skin of an orbiter, to produce a damaging fire or explosion. External tankage solved this problem, at least for the orbiter. A leak of propellant now might indeed be detected, since it would occur in plain view. The leak would also be far less dangerous, for the propellant would waft away on the winds rather than build up to form a dangerous concentration. It thus appeared that in mere months, NASA had scored an impressive coup, addressing these technical issues while simultaneously meeting the OMB's cost limits. As with the Mathematica study, however, OMB officials again found reason aplenty to view this work with skepticism. NASA-Marshall had taken shape as the lengthened shadow of Wernher von Braun, its founder and longtime director. He and his fellow veterans of the wartime V-2 effort, who still held senior positions, had long since nailed their flag to the mast of liquid-fuel rocketry, and had left the development of large solid rockets to the Air Force. The recent Shuttle studies reflected this strong Marshall preference. Thus, early in September, the prospect had emerged that the Shuttle might use a cluster of 156-inch solids as its booster. Lockheed and McDonnell Douglas had both made outright selections of this choice, while North American and Grumman had found no reason to reject it. The winged S-IC, for one, promised the fully-reusable booster of NASA's hopes. Its shuttle would do nearly everything that the Phase B fully reusables were to accomplish, with a billion dollars less in peak annual funding. Yet  because this booster was to grow out of the standard S-IC and would use the F-1 engine, it would continue to demand work aplenty from both Marshall and its contractors. The budget analysts at OMB had been trained to spot flim-flam. They had reason for doubt when they saw that in an astonishingly brief time, NASA had succeeded in devising a new shuttle design with a flyback booster that would make the agency's wishes come true-while still purporting to meet the cost goals of the OMB. Projected cost savings also raised questions, for they seemed disproportionately large when contrasted with the relatively modest engineering changes that had led to the shuttle with the winged S-IC. Were the Phase B cost estimates valid? They were certainly high, and if NASA could receive largesse on such a scale, it could continue to maintain itself in the style to which it had become accustomed. On the other hand, one could equally question the low estimates of the recent exercises. Lockheed's invited particular scrutiny, for it was the lowest-and its peak level, interestingly, was just a hair under the OMB mark of $1 billion. Everyone knew that Lockheed had won the C-5A contract with an unrealistically low bid; everyone also knew that the man who had presided over that bid, Dan Haughton, was now the firm's chairman. Was Lockheed attempting again to buy in? Were the other contractors very far behind? I guess what sticks in my mind more than anything else about it was the difficulty of getting any solid attention paid to alternative designs. I don't mean alternative in the technical detail sense, but alternative in terms of mission requirements and why that mattered. How hard it was to get an examination of alternative specifications of what you would like to accomplish, and the systems designs that reasonably derived from that will lead to each different specification of what you wanted to do. The winged S-IC soon would die as well, for it appeared more costly than the pressure-fed reusable booster which, though it might look and fly like an ugly duckling, was a graceful swan in the realm of budgets, and would survive into the next round of designs. This round would resurrect the solid-propellant booster, and would determine the shape of the Shuttle in the form that would actually be built. Within the internal debates of the Executive Branch, the end game, during the second half of 1971, had much in common with the opening gambits of early 1969. Those gambits had featured opposition to NASA's plans from the Budget Bureau, along with the high-level review panel of Charles Townes that had recommended much less than Tom Paine had hoped to pursue. Now, two and a half years later, a similar review would introduce a concept for a mini-shuttle that would win support from NASA's critics-and that this agency could not accept. We had just finished defending one configuration on the floor and then suddenly they announced they were going to change it. Tiger Teague got the top brass from NASA over here and raked them over the coals. The President's Science Advisory Committee, however, wanted its own sources of information. Nixon's first science advisor, Lee DuBridge, had retired in August 1970, citing his wish to step down "well in advance of my 70th birthday in 1971." His successor, Edward David, had been executive director of communications research at Bell Labs. David inherited the existing staff of the Office of Science and Technology. Within this staff, Russell Drew soon proposed that a new PSAC panel should review the Shuttle's prospects and offer views on how NASA should proceed. Daniel Taft, an OMB staffer with responsibility for the NASA budget, warmly endorsed this review and urged his management to support it as well. On June 16, when Fletcher announced that he was extending the ongoing contractor studies to consider phased development, he had formally advised the OMB of this in a letter. A month later, in mid-July, Daniel Taft drafted a letter of reply for Don Rice, which asked NASA to "identify an orbiter with minimum performance characteristics." These would include low crossrange, along with substantial reductions in payload size and weight. Rice's letter urged Fletcher to place emphasis on "defining approaches which will substantially reduce the overall investment cost" of the Shuttle, citing a number of design approaches that would cover "the full range of alternatives." Rice, however, did not have to cite a preferred configuration that the OMB would support. The above figures provide the basis for developing your 1973 budget submission. The President's budget decisions require that you submit your  budget at or below those figures. [Emphasis in original].... It should also be understood that subsequent developments may necessitate reducing these planning ceiling amounts; thus, there is no assurance that your final budget allowance will remain at this level. 1. Come in with budget that meets spec. 2. Present several alternatives (incl. shuttle) which bring us back to 3.2 outlay & maybe 3.27 authority. 3. Cap...didn't realize manned would be out of business if we made no new starts a la shuttle. Jack Young concurred. Present tentative plans call for major reductions or change in NASA, by eliminating the last two Apollo flights (16 and 17), and eliminating or sharply reducing the balance of the Manned Space Program (Skylab and Space Shuttle) and many remaining NASA programs. ......because it is cuttable, not because it is doing a bad job or an unnecessary one. 2) We are being driven, by the uncontrollable items, to spend more and more on programs that offer no real hope for the future: Model Cities, OEO, Welfare, interest on the National Debt, unemployment compensation, Medicare, etc. Of course, some of these have to be continued, in one form or another, but essentially they are programs, not of our choice, designed to repair mistakes of the past, not of our making. 3) We do need to reduce the budget, in my opinion, but we should not make all our reduction decisions on the basis of what is reducible, rather than on the merits of individual programs. 4) There is real merit to the future of NASA, and its proposed programs. The Space Shuttle and NERVA particularly offer the opportunity, among other things, to secure substantial scientific fall-out for the civilian economy at the same time that large numbers of valuable (and hard-to-employ-elsewhere) scientists and engineers are kept at work on projects that increase our  knowledge of space, our ability to develop for lower cost space exploration, travel, and to secure, through NERVA, twice the existing propulsion efficiency for our rockets. would have a very bad effect, coming so soon after Apollo 15's triumph. It would be confirming, in some respects, a belief that I fear is gaining credence at home and abroad: That our best years are behind us, that we are turning inward, reducing our defense commitments, and voluntarily starting to give up our super-power status, and our desire to maintain our world superiority. 7) I believe I can find enough reductions in other programs to pay for continuing NASA at generally the $3.3 - $3.4 billion level I propose here. This figure is about $400 - $500 million more than the present planning targets. My view is that we should assume that this is a permanent situation, that we should drop the shuttle, and that we come up with a new manned space flight program. In my view, this program should be based on an evolutionary space  station development, leading from Skylab through a series of research and applications modules to a distant goal of a permanent space station.... The transportation system for this manned space flight program would consist of Apollo hardware for Skylab; a glider launched on an expendable booster for the research and applications modules; and finally, the shuttle but delayed 5 to 10 years beyond our present thinking. The new element in this plan is the expendable booster-launched glider. The whole program ties together in that none of it is dead-ended. The glider would be both an up and down logistics system for the research and applications modules, and, at the same time, lead toward the development of a shuttle in the future. The glider would lack engines; it thus would resemble, once again, an enlarged Dyna-Soar. Martin Marietta had advocated such vehicles as recently as 1969; now, with its proposed Titan III-L, it had a launch vehicle suited to this task. Low's notes amounted to admitting that with piloted flight in extremis, this glider might form the basis of a fallback position that NASA might accept if continued budget reductions were to force the agency to abandon its plans for a Shuttle. Needless to say, this was not an approach that NASA would embrace willingly. The agency was still a gung ho outfit, deeply engaged even at that  moment in sending astronauts to the moon, and its senior officials were not about to go back to Dyna-Soar if they could avoid it. Dale Myers, head of the Office of Manned Space Flight, wrote a memo to Low in which he scoffed at the glider, declaring that its advocates wanted no more than to send an astronaut "'whirling about the earth' with no evident use for him in space. In the meantime, these people can get back to doing things as they do them now, with various sized ballistic systems, a relatively constant budget, and a relatively 'status quo' sort of operation." The President read with interest and agreed with Mr. Weinberger's memorandum of August 12, 1971 on the subject of the future of NASA. Further, the President approved Mr. Weinberger's plan to find enough reductions in other programs to pay for continuing NASA at generally the 3.3 - 3.4 billion dollar level, or about 400 to 500 million more than the present planning targets. Significantly, this approval did not embrace the Shuttle itself. Low writes that during the next two weeks, "Fletcher and I debated whether we should not forego the Shuttle entirely and develop instead some alternative manned space flight program." Late in September, however, in presenting NASA's formal budget request for FY 1973, Fletcher screwed his courage to the sticking point and indeed sought funds for a Shuttle. Fletcher, however, was not the only one with ideas on how to build a piloted spacecraft. Within the Flax Committee, reviewing the Shuttle program on behalf of the White House, a member named Eugene Fubini had taken a leading role. He had been the Pentagon's deputy director of research and engineering, and he had willingly met with the same officials of Martin Marietta who had been recommending the Titan III-L and its glider in lieu of a true Space Shuttle. Influenced by Fubini, Flax sent an interim report to Edward David on October 19. This report presented a set of alternatives in which the glider, far from ranking lower than the least acceptable form of piloted space vehicle, was actually the most ambitious option that the Flax Committee was willing to endorse. Moreover, the committee's glider would carry only 10,000 pounds  of payload, one-third as much as the version hesitantly considered by NASA's George Low. What could be less ambitious than this glider? There was the possibility of modifying Apollo spacecraft to make them refurbishable and continuing to fly them using the existing Saturn I-B, on rare occasions. Another option called for developing the Titan III-M and its Big Gemini, a variant of this existing spacecraft that would grow to carry as many as nine people. Such alternatives might keep piloted space flight alive-but it would resemble a patient on life support. Flax's report also addressed the subject of shuttle economics. He dealt specifically with NASA's preferred concept, which called for concurrent development of booster and orbiter, with the orbiter using phased technology. People described this orbiter as "Mark I/Mark II," referring to an initial version that would later be upgraded with SSME engines, reusable thermal protection, and advanced onboard electronics. Considering all of the technological and operational unknowns involved in the shuttle development and the fact that no vehicles of similar function have ever been designed before or have ever operated over the range of flight regimes required for the shuttle, prudent extrapolation of prior experience would indicate that estimated development costs may be 30 to 50 percent on the low side. Thus, the estimates of $6.5 billion in RDT&E 34 for the Mk I/Mk II shuttle program may range between $8.5 to $10 billion, reflecting increased program costs of $2.5 to $3.5 billion. Similar uncertainties must be considered to apply to other non-recurring costs such as production and facilities (amounting to about $4 billion). Thus a possible cost uncertainty of about $5 billion for total program costs might be envisioned giving a high estimate of total non-recurring cost of about $15 billion. At a launch rate of about 40 per year (DOD, NASA and other) over the 13 years used in the NASA cost model and an average payload cost of $30  million (not unrepresentative of the mix of current unmanned payloads), the total payload costs would be $15.5 billion. Thus, even if the total payload cost were saved (including those launched to Mars, Venus, etc.) over a 13-year period by recovery and reuse at zero refurbishment cost, it would, in the case of the high-end cost estimate, barely offset the cost of the shuttle program without discounting. A more realistic (although probably generous) estimate of the savings possible through payload recovery might be 50 percent of payload costs which could account for only $7.5 billion. These few paragraphs delivered a body blow to the Shuttle's economic prospects, for although their conclusions were highly unfavorable, they actually carried a strong bias in favor of the Shuttle. This was because this analysis used current or undiscounted dollars. The Mathematica study had moved heaven and earth to try to justify the Shuttle in dollars discounted at ten percent per year, and members of the Flax Committee had little use for that study's findings. In the words of a committee staff member, "No one believed all the fancy economics and no one believed the mission model. I think they were on  hemp when they were talking about sixty flights per year." Yet it had seemed easy to show that the Shuttle could be cost-effective in undiscounted money. A Shuttle cannot be justified when using cost-effectiveness as the criterion. Yet if piloted space flight was to involve more than infrequent missions in which astronauts would show the flag, then NASA would need help, and in a hurry. The help came from Mathematica, which now gave a strong endorsement to a preferred Shuttle configuration. The Mathematica analysis of May 31 had drawn criticism because it had dealt only with the two-stage fully-reusable approach of Phase B, paying no heed to design alternatives. Yet a comparison of such alternatives, on  economic grounds, promised insights that even the Flax Committee was willing to pursue. Flax's interim report stated that while direct cost-benefit analysis lacked "sufficient credibility to serve as a primary basis for deciding to undertake such an expensive and high-risk program," economic comparisons "are undoubtedly extremely valuable in making cost tradeoffs and in considering alternatives in design and program planning." In studying such alternatives, designers traded reduction in development cost against an increase in cost per flight. This tradeoff had to stay within bounds; if the cost per flight was too high, the Shuttle would fail to capture traffic from existing expendables. Yet the Mark I orbiter, as discussed in Flax's report, would cost $9 million per flight, comfortably under the $12 million of expendables. This was enough of a margin to give this design a strong advantage. Klaus Heiss, who was continuing to direct the Mathematica studies, was not in a position to introduce new design concepts of his own. Instead he proceeded by receiving the contractors' concepts, comparing them using methods of economics. As he pursued such comparisons, he concluded that NASA had not pushed its tradeoffs far enough. The opportunity existed to push the cost per flight as high as $10 million, in exchange for a further reduction in development cost and in peak annual funding. Even at $10 million per flight, all but five percent of the Shuttle's planned missions would remain cost-effective when compared with similar missions using expendable launch vehicles. Heiss saw that a specific class of Shuttle designs would do this. He called this class TAOS (Thrust Assisted Orbiter Shuttle). It would use a standard orbiter, possibly of the Mark I/Mark II type, with an external tank large enough to permit the orbiter's engines to operate with "parallel staging," burning from liftoff to orbit. Two booster rockets would flank this tank, giving added thrust after liftoff, then falling away at staging velocity. The boosters might use pressure-fed liquid-fuel engines. Alternately, they could use solid propellant. Such designs already existed. McDonnell Douglas had one called RATO, Rocket Assisted Take-Off. It put the orbiter's propellants in two external tanks, with a 180-inch solid rocket mounted to the belly. Grumman had TAHO, Thrust Assisted Hydrogen-Oxygen, with a single external tank flanked by twin pressure-fed liquid boosters. This background meant that key NASA contractors already had people who had introduced TAOS concepts and had studied some of their engineering issues. ....cost advantage. 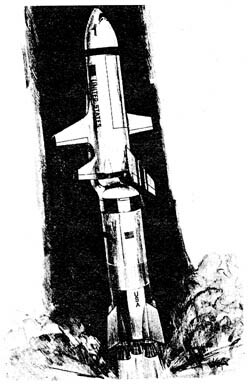 The TAOS approach, however, specifically included the selected Shuttle configuration of 1972, with twin solids, smaller in size, for the booster. Ironically, this specific configuration appears to have originated within the Institute for Defense Analyses, the think tank whose president, Alexander Flax, was challenging NASA's approaches so effectively. The IDA had close ties to the Air Force, which had been using solid boosters for years on the Titan III, and NASA's Charles Donlan gives credit for the twin-solid TAOS to two IDA staffers, Reinald Finke and George Brady. In 1986, Donlan declared that "Brady came up with the configuration that's almost identical" to the one that NASA built. "And so a year or so ago,  I recommended that NASA give him one of their awards, when they were recognizing Shuttle contributors." Heiss nevertheless pressed the case for TAOS within NASA, working with Robert Lindley, the director of engineering and operations within the Office of Manned Space Flight. Lindley had carried out initial cost-benefit studies of the Shuttle, as an in-house NASA effort, and had worked closely with Heiss when Mathematica pursued its subsequent efforts. Heiss would describe Lindley as "one of the few people over there to grasp clearly the real economic and design tradeoffs." Through September and October, Heiss and Lindley exhorted McDonnell Douglas and Grumman to include TAOS designs in their presentations to NASA. Says Heiss, however, "some NASA officials kept telling them to forget it, the configuration had no chance." As late as October 15, in a presentation to the Flax Committee, NASA failed to include TAOS. Toward the end of the month, Heiss adds, "we thought the whole program was on a catastrophic course. .....Science and Technology] and OMB seemed to be drawing back toward some kind of advanced expendable system," based on the Titan III-L or the even less capable Titan III-M. A major shuttle design review loomed during November, and in Heiss's words, "We decided to try and get to Fletcher." The TAOS concept foregoes the development of a Two Stage Shuttle System. With the use of thrust assists of either solid rocket motors or high pressure feed systems-which can be made in part reusable for low staging velocities-the TAOS concepts promise a reduction of the non-recurring costs (RDT&E and initial fleet investment) from about $9 billion or more (two stage systems, including reusable S-IC) to about $6 billion or less, with a minimal operating cost increase, if any, in the operating phase of the TAOS system. 1. The non-recurring costs of TAOS are estimated by industry to be $6 billion or less over the period to 1979 or to 1984-85, depending on the objectives and choices of NASA. 2. The risks in the TAOS development are in balance lower but still substantial. Intact abort with external hydrogen and oxygen tanks is feasible; lagging performance in the engine area can be made up by added external tank capacity. A large reusable manned booster is not needed. 3. The TAOS's that were analyzed promise the same capabilities as the original two stage shuttle, including a 40,000 pound lift capability into polar orbit and a 60 x 15 feet payload bay. 4. The TAOS can carry the Space Tug and capture high energy missions from 1979 on. 5. The most economic TAOS would use the advanced orbiter engines immediately. Our calculations indicate that among the alternative TAOS configurations an early full operational capability (i.e., high performance engines on the orbiter) is economically most advantageous, and feasible, within budget constraints of $1 billion peak funding. 6. The TAOS can use J-2S engines on the orbiter for an interim period. 7. The TAOS abolishes completely the immediate need to decide on a reusable booster and allows postponement of that decision without blocking later transition to that system if still desired. Thereby, TAOS eliminates or lowers the risk and potential cost overruns in booster development. 8. The TAOS can use "parallel burn" concepts, which, if feasible, may change the reusable booster decision. 9. Technological progress may make tank costs, and thrust assisted rocket costs less expensive, thus further aiding TAOS concepts when compared to two stage concepts. 10. TAOS assures NASA an early program definition, and a purpose to the agency. An agreement on TAOS will allow NASA Headquarters a quick and clear reorganization of major NASA centers to meet the TAOS development requirements economically. 11. The TAOS funding schedule makes an early Space Tug development possible. The Space Tug is an important part of the Space Shuttle System. A 1979 Space Tug should recover its complete development costs before 1985 even with the stretched build up of Space Shuttle missions from 1979 to 1985. 12. A clear policy on TAOS development will give an incentive to European countries to undertake and fund the Space Tug development-thereby possibly even eliminating Space Tug funding from NASA budget considerations. 13. The cost per launch of TAOS can be as low as $6 million or even less on an incremental cost basis, with reuse of parts of the thrust assist rockets (either SRM or pressure-fed). With Point 9 realized, the costs of TAOS would practically match the costs per launch of the two stage fully reusable system. TAOS did not take NASA by storm. Its design concepts were already part of the mix of alternatives; they had merely been languishing for want of attention. TAOS, however, proved highly useful as it provided a fallback concept, less costly than the winged S-IC, which NASA would adopt as it continued to yield to pressure from the OMB. For NASA, it was time to have the OMB fish or cut bait. Fletcher had submitted his budget request on September 30, with a line item of $228 million to initiate Shuttle development. This NASA request was one of many budget proposals from federal agencies and cabinet departments; the OMB would modify them and then assemble them into the President's budget, which would go to Congress early in 1972. An early milestone in this budget process, the Director's Review, included a session titled "Space and General Research." Weinberger ran those reviews in 1971. They represented meetings at which OMB staff would recommend actions on agencies' requests, with Weinberger being free to respond. Following standard rules, NASA officials would not be present. OMB staff members were well prepared for this session. A staff paper, prepared in early October, admitted that the use of a single pressure-fed booster would be more cost-effective than use of the winged S-IC. This represented a response to NASA's booster alternatives of September; the pressure-fed option was a rocket stage of the usual type, and the Shuttle was not a TAOS. While this configuration looked better than the alternative, it still was not good enough. The paper concluded that the most cost-effective option of all, more so than any shuttle, was an uprated Titan III with Big Gemini. The aerospace industry will be hurt by continuing indecision and further delay in the shuttle program. A firm go-ahead, on the other hand, will quickly create jobs in the industry. It would not be possible to maintain the Shuttle effort indefinitely as an exercise in design study and analysis. The aerospace industry was set up to build, not to dither endlessly. Its preliminary-design groups, which had carried forward the Shuttle work to date, practiced a highly skilled and specialized trade; if their efforts were not to bear fruit, their companies would be weakened unless senior management could reassign these people to the preparation of other proposals. NASA's Director's Review session took place on October 22, and the OMB staff recommendation was blunt: cancel the Shuttle program. Staff members also proposed that if this was not feasible, the decision should be held off for another year, when the OMB would deal with the budget for FY 1974. Weinberger was not eager to accept such options. Neither was he willing to flatly override his staff, even though this was his prerogative, and endorse NASA's position. NASA wanted the Mark I/Mark II orbiter with winged S-IC booster, and Weinberger was interested in alternatives studied by the Flax Committee. The staff, in effect, decided they weren't going to do it. The staff then told me that, if we wanted to do it, it could be done less expensively. So I was  delighted to hear that; and so they went back and worked with NASA to work out a different configuration. I could have cut it off at the Director's Review and insist that we are going to do it the way NASA wants it. But the opportunity to do it at a lower cost on additional analysis appealed to me. I never had any doubt in my own mind but, one way or another, I wanted to do it. I thought it was the proper thing for the government to do at that time, and that we needed some forward-looking new activities geared toward the future instead of the past. Weinberger: is a real space buff. The only one in OMB really positive toward the NASA program. Causes Rice to over-balance in the opposite direction. Everybody lower in OMB is negative. Rice: the most knowledgeable opposition comes from Rice. Feels that NASA is out of control; however, he will probably support a glider on a TITAN IIIL. Ed David: was noticeably quiet, measuring his words, and repeatedly saying that he only represented science and that other factors are also involved.... Not really plugged into the President. Flax: Fubini is really running the Flax Committee. Flax apparently states that no program as large as the Shuttle will gain continuing support. We need a less costly program.... Anders feels that Flax is driving David toward the glider and not vice versa. Anders believes David will support the Orbiter  with the parallel staged pressure-fed booster if Flax so recommends. Whitehead: Whitehead could be helpful in making Flanigan a meaningful communications link to the President, which Anders believes Flanigan needs to be. Whitehead's main motivation now is to improve the Fletcher/Flanigan communications link. Whitehead can be extremely helpful in selling the NASA desired Shuttle approach.... Believes in a $3.5 billion NASA. Rose: is the California unemployment buff in the White House. Tries to be helpful and sees Flanigan all the time. He defers to Whitehead when Whitehead is present. Flanigan: states that the Shuttle story is improving; however, he is by no means convinced that there should be a Shuttle. Is strongly influenced by Whitehead, Rose and David. Peterson: is the most negative of all about NASA. Perhaps the most dangerous opposition we have within the White House. Believes the space program is the place to take money to stimulate technology. Asked why not take $1 billion out of space and who needs manned space flight. These were not the scoundrels featured in the subsequent bestseller on Watergate, All the President's Men. Though skeptical, they were open to argument and perhaps even to persuasion, and it was up to Fletcher and Low to try to sway them. On November 22, Fletcher responded to a request from Jonathan Rose, a member of Flanigan's staff, and sent him a 10-page paper that presented NASA's case for the Shuttle. On that same day, Low addressed a request from Rice and offered his own paper, which gave a reply to Flax's interim report of a month earlier. Flax had discussed a range of alternatives that included Big Gemini and a small glider. Low now gave his own range of alternatives, with each receiving a succinct description. Big Gemini was conspicuous by its absence, but in other respects, Low's list covered the most important  configurations of 1971. At the high-cost end of this list were two-stage reusables, both the fully-reusables of Phase B and the variant with external hydrogen tanks on the orbiter. In the middle was the Mark I/Mark II orbiter with a single large tank carrying both propellants, and four choices of booster: winged S-IC, single pressure-fed first stage, TAOS with twin pressure-fed boosters, TAOS with twin solids. Anchoring the low-cost end was the Titan III-L with a glider carrying payload of 30,000 pounds. Low recommended a version of TAOS: "The most promising candidate configuration today is the Mark I/Mark II orbiter with the parallel-staged pressure-fed booster," with all engines burning at liftoff. Even a small (10' x 20') glider could capture all manned space flight traffic, e.g. : Space station visits and return to Earth (station modules could be launched unmanned by expendable rockets). Since the Shuttle is not an economic system under optimistic assumptions, the importance of whether or not all of the payload benefits are realized becomes less significant. The important factors are really such considerations as national prestige, continuation of a manned space flight program, and advancement of technology. Any of the reusable vehicles discussed in this paper (even a 10' by 20' glider) provide this type of intangible benefit. .....15' x 60' orbiter for less than half the investment cost. The elements of a consensus now appeared to be at hand. Following Low's presentation to the Flax Committee, its members felt that NASA had "finally come around to something reasonable"-with the reasonable thing being the glider, not the TAOS booster and orbiter. Such a glider also appeared on the option lists of both Low and the OMB staff. 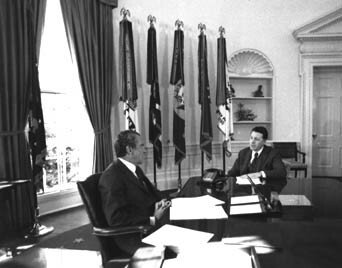 Within the White House, Flanigan met with two of the top executives of North American Rockwell. He told them that there definitely would be a Shuttle program, that the government was about ready to make the decision, but that some issues still had to be sorted out. Weinberger had already rejected Big Gemini; Low now argued against the glider. Lacking its own propulsion, it could not make use of designs such as TAOS to keep the cost per flight within bounds. Instead, a glider would  require its own two-stage rocket, which would drive the cost per flight as high as $35 million. Low met with Rice, Whitehead, Rose, and Edward David, and wrote that "we demonstrated quite conclusively that a glider would not be cost-effective. Apparently, we also made considerable headway with all the glider advocates in convincing them of this point." For NASA, however, this Shuttle that would fit the budget amounted to a throwback to earlier years, when NASA had considered only its own needs and had not yet introduced the large payload capacity that the Air Force would demand. The new shuttle would not be a glider; it would have its own propulsion. It would, however, carry only 30,000 pounds, in a 10 x 30-foot bay. It offered considerably less than the lowest-cost version of TAOS considered to date. For months, NASA's senior administrators had been fighting with the OMB, which time and again had pressed for less costly designs. These same administrators then had to turn around and act as an in-house version of OMB, pressing their engineering managers to pursue such designs. These managers operated at the working level; meetings with Weinberger or Flanigan took place far over their heads. They liked the two-stage fully  reusable Space Shuttle; they had nurtured it and did not want to give it up. Low and Myers thus had to put a good deal of effort into keeping their troops in line. This internal NASA debate, paralleling that between NASA and the OMB, brought such contretemps as Max Faget's reluctance to accept Air Force requirements, the resistance that Heiss and Lindley encountered when they advocated TAOS, and insistence at NASA-Marshall that the booster had to be liquid-fueled. The December 2 Space Shuttle, which the OMB proposed and Nixon endorsed a week later, fell outside the bounds of what NASA was willing to take. Fletcher, dealing with both the White House and the OMB, would promptly declare that it was unacceptable. 1. Aviation Week, January 18, 1971, pp. 36-39; Jenkins, Space Shuttle, pp. 67, 95; letter, Low to Professor John Logsdon, January 23, 1979. 2. Aviation Week: April 5, 1971, pp. 36-38; June 7, 1971, pp. 55-61. 3. AIAA Paper 71-804; Report MDC E0308 (McDonnell Douglas). 4. AIAA Paper 71-805; Reports SV 71-28, SD 71-114-1 (North American Rockwell). 5. Report LMSC-A989142 (Lockheed); Jenkins, Space Shuttle, pp. 98-103. 6. Report B35-43 RP-11 (Grumman), Section 1; Aviation Week, March 29, 1971, pp. 45-46. 7. Report B35-43 RP-11 (Grumman); Aviation Week, July 12, 1971, pp. 36-39; Powers, Shuttle, p. 240. 8. Report MDC E0376-1 (McDonnell Douglas). 9. Jenkins, Space Shuttle, pp. 107-116; Hallion, Hypersonic, pp. 1018, 1048-1068; Reports SV 71-40 (North American Rockwell); (Grumman); LMSC A-995931 (Lockheed), Section 1, Interim Report (McDonnell Douglas). 11. Report B35-43 RP-11 (Grumman); Aviation Week, July 12, 1971, pp. 36-39. 12. Report MDC E0376-1 (McDonnell Douglas). 13. Fletcher, statement, June 16, 1971; Aviation Week: June 21, 1971, p. 19; June 28, 1971, p. 16; Gomersall and Wilcox, Working Paper. 14. Rocketdyne, Expendable Launch Vehicle Engines; Jenkins, Space Shuttle, pp. 110, 113-115. 15. Letter, Fletcher to Van Allen, July 12, 1971; Aviation Week, June 21, 1971, p. 19. 16. Aviation Week: June 28, 1971, p. 16; July 12, 1971, p. 38; August 2, 1971, pp. 40-41; Report MCR-71-309 (Martin Marietta). 17. Jenkins, Space Shuttle, pp. 122-123; Aviation Week, June 28, 1971, p. 16. 18. Reports SV 71-40 (North American Rockwell); LMSC-A995931 (Lockheed); B35-43 RP-21 (Grumman); Interim Report (McDonnell Douglas). 19. Aviation Week: September 20, 1971, pp. 16-17; October 11, 1971, p. 23; October 25, 1971, pp. 12-13; Reports LMSC-A995931 (Lockheed); MDC E-0497 (McDonnell Douglas); B35-43 RP-30 (Grumman); SV 71-50 (North American Rockwell); Ballistic Recoverable (Boeing). 20. Morgenstern and Heiss, Analysis, May 31, 1971, p. 0-15. 21. John Mauer interview, Charles Donlan Washington, October 19, 1983, pp. 19-20; Loftus et al., Evolution, pp. 15-18. 22. National Journal, August 12, 1972, p. 1299. 23. NASA Tech. Directive GAC-3, 16 September 1971; Reports B35-43 RP-28 (Grumman), p. 11; SV 71-50 (North American Rockwell), pp. 2, 3, 5. 24. Memo, Taft and Sullivan to Rice, November 29, 1971. 25. John Logsdon interview, Donald Rice, November 13, 1975, p. 1. 26. John Mauer interview, Charles Donlan, Washington, October 19, 1983, pp. 23-24. 27. National Journal, August 12, 1972, p. 1294. 28. Science: 28 August 1970, pp. 843-844; 18 September 1970, p. 1185; 23 October 1970, pp. 417-419; National Journal, August 12, 1972, p. 1295; memo, Taft to Young, January 22, 1971; letters, Rice to David, July 14, 1971; David to Fletcher, July 26, 1971; memo, Drew to PSAC Space Shuttle Panel members, August 4, 1971; Myers, Memo for Record, August 19, 1971; NASA, "Documentation of the Space Shuttle Decision Process," February 4, 1972. 29. NASA SP-4012, Vol. III, p. 12; letter, Fletcher to Rice, June 16, 1971; memo, Taft to Rice, July 15, 1971; letter, Rice to Fletcher, July 20, 1971; letter, Weinberger to Fletcher, August 2, 1971. 30. Fletcher, meeting notes, August 5, 1971; Weinberger, Memorandum for the President, August 12, 1971. Reprinted in part in NASA SP-4407, Volume I, pp. 546-547. For Nixon's comment see attachment to memo, Huntsman to Shultz, September 13, 1971. 31. Low, Personal Notes No. 52, August 15, 1971; Low, "Space Transportation System Planning," August 17, 1971. 32. Memo, Myers to Low, September 29, 1971; John Mauer interview, Leroy Day, October 17, 1983, p. 29. 33. Memo, Huntsman to Shultz, September 13, 1971; letter, Fletcher to Shultz, September 30, 1971; Low, Personal Notes No. 55, October 2, 1971; letter, Fletcher to Weinberger, October 19, 1971. 35. Note, Frank Williams to Von Braun, August 23, 1971; Low, Personal Notes No. 56, October 17, 1971; letter, Flax to David, October 19, 1971. 36. Memo, Sullivan to Rice, October 19, 1971; Low, Personal Notes No. 55, October 2, 1971; John Logsdon interview, Dave Elliot, p. 3. 37. Letter, Flax to David, October 19, 1971, p. 6; National Journal, August 12, 1972, pp. 1298-1299. 38. Report B35-43 RP-28 (Grumman); Interim Report (McDonnell Douglas), pp. 13, 25; John Mauer interview, Charles Donlan, October 19, 1983, pp. 28-29; John Logsdon interview, Donald Rice, November 13, 1975, p. 2; National Journal, August 12, 1972, p. 1299. 39. National Journal, August 12, 1972, p. 1299; John Mauer interview, Charles Donlan, October 19, 1983, p. 28. 40. Heiss and Morgenstern, Factors. Reprinted in NASA SP-4407, Vol. I, pp. 549-555. 41. Reports MDC E0497 (McDonnell Douglas), p. 1-23; B35-43 RP-30 (Grumman), pp. 2, 17. 42. Letters: Fletcher to Shultz, September 30, 1971; Fletcher to Weinberger, October 19, 1971; NASA, "Documentation of the Space Shuttle Decision," February 4, 1972; Space Policy, May 1986, p. 112. 43. NASA, "Documentation of the Space Shuttle Decision," February 4, 1972; John Logsdon interview, Caspar Weinberger, San Francisco, August 23, 1977, pp. 5, 13; Space Policy, May 1986, p. 113; Science, 30 May 1986, pp. 1102-1103. 44. Low, Memo for Record, November 15, 1971. 45. Memo, Fletcher to Rose, November 22, 1971; letters: Low to Rice, November 22, 1971; Fletcher to David, November 24, 1971; Low, Personal Notes No. 59, November 28, 1971. 46. Memo, Taft and Sullivan to Rice, November 29, 1971. 47. OMB, Memorandum for the President, December 2, 1971; OMB, "Space Shuttle Program," December 10, 1971; Low, Personal Notes No. 60, December 12, 1971; letter, Low to John Logsdon, January 23, 1979.